I think it is safe to say that I have gone through a bit of a blogging identity crisis throughout the past year. I've written a couple of posts where I basically threw-up my feelings through my keyboard trying to make sense out of what was spinning around in my head. Several years before I was a mother to my precious babe I started jounaling our life and my stories through my blog. Then, after having Eli last year I did what came naturally to me and continued to blog about our life; the good, the bad, the funny and the boring. And it just so happened to contain a baby now. And then I started to notice that people were referring to me as a mommy blogger. It honestly didn't bother me, but got me thinking, am I a mommy blogger now? I obviously wasn't a mommy blogger when I started blogging, so did going through 9 months of heartburn, 2 days of labor and several weeks of postpartum baby blues instantly transition me into mommy blogger status? I have to admit that I never liked the word "mommy blogger" I felt like it was a bit of a bad word. "Oh she's just a mommy blogger". It sort of had a bad connotation linked with it. I didn't necessarily not want to be a "mommy blogger" I just never thought I qualified as one. When I write a post, even if it about a "mom" problem I hope that others can relate to it, even if they aren't a mom. When I started blogging before I was a mother or even a wife, I never thought about what "type" of blog I had. I was just posting useless information about watching Fresh Prince of Bel Air, or talking about my undying love for the television show Lost. I was blogging to blog. No rhyme, reason or method to it. But maybe my blog transitions with each stage of life? First a newlywed blog? Then a mommy blog? I'm putting question marks because I honestly don't know. So I'm wondering... when you read a blog do you "type" it in your mind? What classifies a blog as a "mommy blog" to you? Not that any of this really matters, but I'm been thinking about it for a day or so, and what better place to bring my thoughts than my own blog. Who reads this blog? Introduce yourself! Are you a mom? Newlywed? Teenager? I'm curious. And you don't have to tell me what you think this blog is, I'm just interested in who reads my thoughts and what your thoughts are on blogging. Random I know. your blog is great! types aren't at the forefront of my consideration when i read a blog. the tone, language, and overall types of posts experienced are more factors. personally i think you do a good job just posting about your life -- eli, faith, scentsy, etc. all things that are important to you! i am a newlywed who blogged off and on during my wedding planning. i was introduced to your blog through blue eyed bride. I started reading your blog when you were pregnant so I guess I see this as a mommy type esk blog. Sorta. I'm a 1.5 year newlywed with no kids yet and my husband is in grad school; I'm job hunting. Love reading; keep it up! I'm "just" a college kid who started blogging in her senior year of high school. It's basically just a place for me to release all the thoughts in my head where I know no one in my real life knows about it. (Most people don't even know I have a blog.) I blog about my many hospital stays/surgeries/illnesses, I blog to rant about how aggravating my family is (ha! ), I blog about school, I blog to work out drama in my life, I blog about whatever is in my head at the end of the day. And so I get that not many people are going to want to read it, because it's probably not all that entertaining to read a day-by-day play of my life, but I blog because it's fun. The funny part is that most of the blog I read are "mommy bloggers" (and I hate that name too). I get attracted to blogs by the personality of the writer, I'm way less concerned about what "type" of blog they are. I don't remember how I found your blog, but I liked the post, and low and behold you were added to my Google Reader and so now I read your every post :-) I think I do sometimes classify bloggers in my mind, but I read a whole range of blogs. What continues to make me enjoy reading yours is your faith, your love of Friday Night Lights (anyone who loved that show is a friend to me), and your willingness to wear the Giants colors for your husband. I'm sure some folks do read because you are now a mommy and they can relate to that portion of your life, but that's just all the more people you can share your faith with and what God has blessed you with! I never really thought about you as a "mommy blogger". I moreso thought of you as a blogger who also happens to be a mom. Maybe I'm weird? I suppose our blog is "adventure"-themed, but that's because I think life is one great adventure. I still write about stuff like losing weight and TV shows I love. hi there! i'm a new reader to your blog and one of your newer twitter friends (mmmnuggets). i'm a wife, insurance professional, and law student. no children yet, but i enjoy reading about different people and their lives and families. I have two little guys, a 2 year old and an 8 month old. I've been reading your blog since right before you found out you were going have to Eli. I love your blog. I like how real and down to earth you are. I love seeing what you may post about next. I don't think you are a "mommy blog". I think you are a "Megan Blog" writing about what's currently on your heart or your mind, or spilled on your shirt :) Keep it up...it's perfect! My name is Laura. I've been reading your blog for a couple of years. I am married with a baby girl and a very hectic career. I don't type blogs I do however loose interest very fast when a blogger has a baby and then blogs about nothing except the baby. Your blog is great because it's a real picture of someone's life. You blog about motherhood, being a wife, being a woman of faith etc. But I think what I really like is that your life never seems perfect. You do a good job highlighting the really hard job of juggling and the chaos that sometimes follows. Hello Megan! I've actually been a reader for forever... since before you were pregnant and before I even started blogging. I can't even remember how I found your blog. I agree that you are pretty well rounded on your blog, and I wouldn't necessarily call you a "mommy blogger" (although those are my fav blogs). Anyways, yours is now one of my favorite blogs because I also have a son who is just one or two weeks younger than Eli. I was so stoked when you announced you were pregnant (I hope that doesn't seem as creepy as it reads). I love reading your mishaps and successes and I totally relate to pretty much everything you say. So yeah, I love everything about your blog, but definitely favor the mommy posts! Keep up the good bloggin! ps. how many times can I say blog in one post?! sheesh! I think people choose blogs to read based on what they identify with so they'll type it in their own minds. The blogger themselves dont necessarily establish a type unless they do it on purpose like only writing about fashion or cooking or such. The rest of us are just "life" bloggers :) i have been following you for a few months and love it all. I started blogging about my wedding. Now I consider myself a lifestyle blogger. I can't be a book blogger because I blog about food and other non book related life. Like most other commenters, I can't remember how I happened upon your blog, but I was pregnant at the time and you had just had Eli. I have loved 'watching him' grow up :) I would consider you more of a 'lifestyle blogger'. Whatever 'type' you end up being, please just continue to blog! I look forward to your posts! I've never agreed with the people who say that you have to have a topic that you focus on for your blog; I read blogs just because I like to know about other people's lives and I thinking you're doing a perfectly good job of that. I'm like you- I write some posts about parenting, but definitely not all. I think my blog is a reflection of me- being a mom is a big part of who I am, but it's not all I am. I don't really classify blogs...unless someone is posting outfits of the day, then they are a fashion blogger in my head and I'm instantly jealous, bc all my clothes smell like baby throw up. I classify you as a fun witty blogger. You are very identifiable. Is that a word? I can relate your stories to my life, and I like that. I like it a lot! Hey lady! We had baby boys around the same time! I had a baby last April named Ford, so every post you write, I always think- ME TOO! My blog started as a way to just chronicle the goings on of our life, but like you has sort of "morphed" into a " Mommyblog. "I guess that's what happens when your baby takes over :) Heehee. I think your blog is great! I love the tone of your writing! Blogs and sometimes blogs about her child or mom issues. You have sort of a humorous lifestyle blog that is fresh and not really a "type" in my opinion. Just keep on being who you are because it is great! Hi, my name is Megan too. I started blogging August of 2010 and started reading your blog a little after that. I started blogging when I was a newlywed and now I too am a mom of a little boy. It's nice to finally "meet" you. Hi! I've been a reader forever (long before the baby and wedding) but I can't remember if I've ever commented before or how I even found your blog to begin with. I don't "type" blogs, I just find ones I like and follow along. I wouldn't consider it strictly a mommy-blog but a blog about your life (which happens to have a pretty cute little dude in it now :) ) I love reading about your life and little guy. I'm a mama who blogs about having two little princesses. I love having a record of all the little moments I would otherwise forget :) love reading about your life & sweet boy! i don't even think about the 'types' of blogs. i just read along with people who make me laugh! i'm 25, single with no kids but i was a nanny for a long time. one day i'll have children of my own but hopefully not any time soon! Hi Megan! I've read your blog for a few years now and I don't think I ever thought about you as a "mommy" blogger, which I don't think is a bad thing in itself. I have always enjoyed reading about your life, thoughts, and stories! I'm 24 and a student, no kids, but I love hearing your stories and that you share your struggles too! I have been reading your blog since last year and I don't think you're necessarily a mommy blogger. You're just you and you talk about what's close to your heart and funny+interesting random things in your life. I love reading your blog! Ps: been with my bf for 5 years and sometimes I wonder when he will ever propose! I have been reading your blog since before the birth of your son, and honestly never thought of you as a "mommy blogger"....you have continued your style, but now with some fun new stories thrown in about your sweet baby. I'm married and don't have kids, nor do I think there will be kids in my future. I love reading your blog. :) I have a blog as well, and always stop and think about the few people who read and what they are thinking, but then I remember that's for me...it's my journal of life, and if anyone wants to come along for the ride, then I love that they read it and enjoy it. It's fun! I often struggled with that title too! Not sure why being a mommy blogger left such a bad taste in my mouth, but it did. Maybe because I blogged before being a mommy and I didn't want my blog to turn into baby central. I have a lot of readers who aren't moms and I didn't want to lose them. As for how I found you, I think it was through Twitter. Hey! I've been reading your blog now for several months. I came from Blue Eyed bride and I just love you! I have a little girl who is almost 9 months so I enjoy reading what Eli is up to so I know what's to come. =) I also enjoy reading what you guys are up to as well. I think now that I'm a mom I read more blogs where others are in the same season of life as I am. You do a great job and I love reading! Hi! I've been following for awhile. I think I found you from In This Wonderful Life. I started following because we were pregnant at the same time, and I enjoyed being able to relate. I don't really "type" blogs, I just follow the ones that interest me and that I feel I can relate to. My own blog is basically just a journal of all the going-ons in our life. I don't usually classify blogs. If I do, it's usually more like, "She has a recipe blog." or "She has a craft/DIY blog." My feelings on "mommy blogger" are the same as yours, and really, I think everyone's definition of it is different. Nope, I don't think in "types." I just read lots of blogs 'cause there are a ton of interesting writers in all walks of life. I'm single, 30, raised in Oklahoma (my parents and extended family are still there), but now I live in Ohio. I started reading your blog when someone else posted a link to your wedding pictures. Now I just really like hearing what you guys are up to and watching your little guy grow up. :) I promise I'm not a creeper! Blogging is such a funny thing for that reason. I just think you are entertaining in general. I have not considered you a mommy blogger, more of a life-in-general blogger. I am a total flag waving mommy blogger- its for my kiddos and I. I don't scrapbook-I blog to preserve memories. That's probably why I only have like 20 followers, my mom is one of 19 other people that find my potty training frustrations entertaining! I love your blog. And I have for years. Hi Megan I started reading your blog about two years ago I found you through someone but I don't remember who and I'm not sure I've ever commented here but first time for everything. I am a mom so I guess I'm a mommy blogger I'm also a sporadic blogger. Our kids are pretty close in age my daughter just turned 1 so I feel like I can relate to you and I like your writing style. I don't classify blogs I read I read what interests me or what I'm drawn to. You're also in OK and so am I so I feel like I relate there as well. That's why you're a favorite. I found your blog through kellys korner and you had already announced you were having a boy...not too long after that I found out I was having a boy! I really enjoy your blog...and still go back to a few of your posts to get a good laugh...do love the one about the cookie cake when you were announcing your pregnancy..haha! I'm a wife, mother, nana, retired elementary school teacher. I've been reading your blog for quite some time, even before you had Eli. I think I found you through Whitney G's blog. I enjoy your blog very much. Keep up the good job of doing what you do! You're doing an excellent job! I.put no thought what-so-ever into what 'type' of blog I happen to be reading. I love all kinds of blogs and never stereotype towards any of them...I love em all! Ha! But seriously, I've been following your blog for awhile now and I just love your honesty about everything, your relatable and I love that. I also love your sense of humor so whatever kind of blogger people want to categorize you as, I love it! I'm Mary. Mom to Sebastian (13 months) and we live in Scotland with my husband. I'm a Book Blogger. I'm not sure if I type cast blogs. I never thought about it. I probably do somewhat, but not in a negative way. It defines what I'm reading about and maybe why I'm coming to your--and other--blogs. What am I here for anyway? Advice? Friendship? Knowledge? Entertainment? Boredom? I think it is good to have a definition. Who are you anyway? Who is your target audience? Pretty sure you have some idea who I am... but I don't subscribe to the thought process that you're either a Mommy Blog or a Newlywed Blog or any one type... if anything, I'd say you have a "Lifestyle Blog" because you blog about your life. I don't typecast blogs... although you might say I read a LOT of blogs that could fit under the title Mommy blog. Hmm, what does that say about unmarried, un-babied me? I started blogging when my husband and I spent a year in Malawi. I kept going. I have an 8 month old, but I don't want to be considered a mommy blogger. And I don't think you that way. I read your blog because you are hilarious. The fact that you have a super cute kid is just a plus! I am a newlywed with hopes of starting a family in the near future. I think your blog was one of the first blogs I started reading when I started my blog in 2008. I was drawn to your writing style and your way of life I suppose. I enjoyed reading about your life, and I think I choose the blogs I read on the basis of who I would probably want to be friends with "in real life". I am a 28 year old mother of one son who is almost 16 months. i stumbled upon your blog a few months ago. it is great! i read it every morning. my son's name is peyton and my best friend's son's name is eli so i love your son's name. keep on blogging about what makes you special- the variety of being married, having a job, and being a mother. I am a mother to 2 beautiful girls - ages 8 & 5 (I feel old when I say that :)). I am married (7 years or something like that), work full time, I am a "dance mom" & so on... I have been reading your blog for quite some time now. I don't put a "type" on you except that I LOVE to read your blog. I am a mommy. I do gravitate towards mommy blogs but I read other blogs as well. I love your blog! I love your blog. I love the cute pics of your little one, I love your sense of humor, & I love when you post meal plans and recipes. I'm a blogger with an identity crisis of my own...haha! I started out wanting to write about struggling after a divorce but 3 years later I've met the true love of my life and am engaged with a whole new list of things to blog about. I'm a married mom of 3. I'm 36. I found you from Kellys Korner. I read because I just think you are funny and a great writer. Love your posts and you are a great mom! I read because you talk about everything, like I do! I'm a new mom too and I have this same problem. I don't think I have a "type" of blog that I prefer or that I am myself. -It seemed as though we were in pretty similar life stages, so I could totally relate. I don't have children yet, but it's been fun reading along with your updates - and no, I wouldn't necessarily say you're a mommy blogger at all! I don't think I've ever commented before, but I've been reading your blog since right before you found out you were preggers! I'm in my mid-20's, married, and have a little blog myself of my husband and I's adventures...although, I will warn you, they aren't that exciting! Ha! I can relate to a lot of your posts and love reading about your life now that Eli has come along :) Keep it up! I'm a single girl in her late (blech) twenties who blogs to blog. I blog about a mish-mash of everything. Unless a blog is completely centered around one certain topic (fashion, cooking, crafting, losing weight, etc), I don't read it as though it is a certain type. We all go through phases in our life. If we're blogging about life, then it would follow that we might focus on that phase, at that time. Megan, I would NOT worry about what "type" of blog you have. Whatever you are doing is working. You blog regularly, your content is good, and you have a ton of readers. So it doesn't matter what type it is. You are honest and you blog about your life. You happen to be a mommy. Does that make it a mommy blog? Perhaps. But it's a great blog. I don't type you as a Mommy blogger, but I started reading your blog before Eli, so maybe that's why? I don't think there is anything wrong with being a Mommy blogger, I love reading those blogs too! I feel like the posts you write relate to anyone babies or not, pictures of Eli are just an added bonus! I'm in my late 20s and I think we live in the same town :) that's what caused me to stick around and keep on reading! Hi! I am 33, married, have no children, and live on the East Coast. I like your blog because of your honesty, whether discussing your lovely son or other aspects of your life. Whatever your "category," your blog is one of my favorites and will continue to be whether you talk about being a Mommy or not! I found your blog through KellysKorner and have been with you since before Eli. I am a married woman with a dd who is 24 and a deceased son who would have been 29. I don't think it matters what type of blog a person has, it's that they have followers who can connect with them no matter what the subject is. I originally connected with you because you reminded me of my dd. You are both 20 somethings, married and with good convictions about life. Now that you have Eli,you are helping me relive the baby days and helping me prepare for grandbabies. Hi there! I am a long-time reader -- still kind of a newlywed (married almost a year) and without kids (so far). I started reading your blog before you were pregnant, so I definitely don't think of you as just a "mommy blogger." You share so much -- recipes, fun stories of married life, etc. -- the cute pictures and tales of Eli are just one of the many things I love to read on your blog! The best part is that you write about everything with such honesty, I often find I can relate even though I'm not a mom yet. I have been reading your blog forever and I love it. You have a good balance of all aspects of your life. Plus, you crack me up so I continue reading. Hi Megan! Fret not, I do not think that your blog could be considered "a mommy blog". I read it because I enjoy your writing style. I identify with a lot of your concerns from the Subway employees shirts touching your sandwich to obsessive webMD reading to different mommy worries. I very much enjoy your posts about faith, managing a household, marriage and family. I am a 31 year old married to my high school sweetheart & am a new mom to a 5 month old boy. I keep a blog of my own, mostly to document/journal what our family is up to and sometimes fear that I've become "a mommy blogger"...then I think about the fact that since the purpose of my blog is to chronicle the life of my family, obviously, our little guy is going to take center stage. Started reading your blog through Kelly'sKorner, on a (boring) day at work when I just needed something new to read. I like the way you write - something in every one of your posts makes me laugh. I don't give a blog a "type" at all - in my mind it's more about the writing. I'm a 30-something female...not married, but hope to be in the future, and no kids but again, hope to get there at some point in the future! 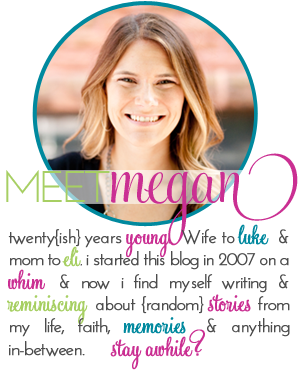 Hey Megan - I have been following your blog for sometime now, can't even remember how I found it. but i love reading your posts and seeing pictures of your sweet family. I think it is for sure normal to feel how you feel, I have just a little silly blog where I post the worlds most random things and I only have like 4 or 5 people reading....so keep your head up and keep blogging! I love to read it! I can't remember how I originally found your blog, but it was one of the first ones I started reading back when I started blogging in 2008. I'm a new mom now and I love reading because it seems like we're basically in the same stage of life and it's so great to read along with someone who's going through the same issues and struggles! I don't know that I think of your blog as a mommy blog, but maybe that is because I am one? I have never considered that I was one, but now you have me thinking I might be! I like to think that my blog is just me writing about whatever I am thinking about at the moment. Sometimes that's my baby, sometimes my faith, sometimes events that we have going on. Anyway, whatever your blog is, well done! And by "whatever your blog is..." I meant, however you classify it. :) That didn't come out right. Hi! I started to read your blog before you announced you were pregnant because I found you to be relatable and have continued to read as you had Eli... As an expectant mom myself, hearing your stories both make me laugh as well as feel prepared for this huge change coming in my life! Don't feel pressure to be a type of blog- I think it's more fun to not have a type! I totally dont have a category that I put you in. I feel the same as you. I used to be a travel/photo/life/dog blogger and now its all about the kid. Not a bad thing but I hate being called a "mommy blogger." Sounds like I do nothing else but stare at the computer and write about my kid! I remember a little ways back you said "I'm going to clean up my twitter and take everyone off who lurks" and I was sad b/c I thought I'd get the ax. Lol, thankfully I didn't! I'm a mom of 2 and *started* a blog several years ago but haven't really kept up with it. I just really enjoy reading about what others do in their lives, how they make their decisions, and etc, etc. Hey! I don't think I have ever commented but I read often. I know what you mean about hearing the term "mom blog" and it almost sounding like a bad thing. I started reading your blog before you were pregnant and often laughed at what you wrote so your sense of humor is what drew me to your blog. I have a little boy who will be 2 soon so I have always enjoyed reading your journey through pregnancy and becoming a mom! That being said, I read and love all sorts of blogs, but none because of "type." I don't even know who came up with the idea of "typing" blogs. To my way of thinking, people aren't just one thing and their blogs probably aren't either. I read the blogs that speak to me in some way, make me laugh, are relatable, etc. Most likely, a combination of things. 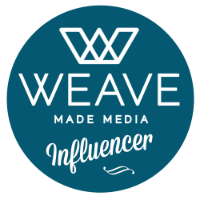 Label or no label, just please keep blogging exactly as you have been doing, because it's great and it works! I'm Nicola, I live in the UK and i'm in my early 20's. I have been married for almost 2 years and have a ten week old baby. I do have a blog myself but never really post, mainly because of laziness to be quite honest. I wish I had the drive to commit myself to a blog like you because I think it must be so cool to look back on. I have been following your blog for quite sometime. I think from in between you getting married and having Eli, I can't remember how I found it. I also follow you on Twitter (Yorkshirelass_). I follow you mainly because I love your tone of writing and the way you describe things. I often find myself LOL at different posts and sometimes read them to my husband (sorry, hope you don't think i'm a creeper!). I also follow you because we are in similar stages of life so it is nice to read about someone else in similar circumstances. I've been reading along for a while now and I always smile when I see your posts in my reader. I know it's going to be funny but more importantly I know it's going to be real. Hi Megan, i'm Sharon from Australia and i have been reading your blog from days before you moved into your home. I am a single Mum to two teenagers and just love reading your blog. I think you write very well. Alot of your posts are funny and alot of what you write is very easy to relate too. You have a beautiful family and i just think your blog is very refreshing. I also love your name as that is my daughter's name! I don't really think of blogs as 'types' as such, but i guess mine would mostly be a gardening blog as I am very hesitant to put pictures of my kids on there. Keep writing, I always love to read what you have to say. I've been reading your blog for a few years but presently I'm a freshly engaged girl (as of February 25th!) I love your random and miscellaneous topics! They're unpredictable. I also love how honest and sometimes self-deprecating you can be. It's my favorite type of writing. I've been reading your blog for a few months now, I am a new mommy (my little one is 4 months). I am trying to become a better blogger but now that I am back at work I just can't find the time!! Hi! I've been reading your blog for about two years now. I think I found it through Kelly's Korner. I was drawn to your blog because I remember thinking that we were in a similar season of life--I'm 28, have been married for 3.5 years, and live in the Midwest. I don't have any kids of my own but I'm a nanny to eight kids so I find myself relating to mothers better than non-mothers! Somewhere along the line I started following you on Twitter too. I've always liked your blog because of your honesty. I admire that you never try to portray an idyllic form of life--you just talk about what's real! I've never thought of you as a "mommy blog." You are a mommy that blogs, but I think that's different from an actual mommy blog. Being a mom is a huge part of your life now, so of course you are going to blog about it--but that doesn't make you a mommy blog (especially since you started blogging long before you had a baby). I just think of your blog as real. It doesn't necessarily have a specific type--it's just life as you know it!